The standard Ku-Band VSAT terminal on ships and larger yachts is usually 1 meter or more. The larger the antenna, the further toward the edge of coverage one can operate, and the more immune to outages from rain fade during thunderstorms. The larger antennas are also more eligible to passing higher bandwidths. Larger antennas have a more defined, narrower beam width, and are less susceptable to adjacent satellite interference, which can reduce performance on smaller sub-meter antennas. If you have the space onboard, and can support the weight, and the cost of the terminal, a 1 meter or greater antenna is definitely the optimum choice. Most satellite service providers accept standard 1 meter antennas on their networks on all their beams. The networks are generally optimized around 1 meter antenna. Since there are many choices of satellite service providers offering Ku-Band services, selecting a standard Ku-Band antenna allows one to shop arounfd for the best service, and you are not locked into any particular provider for the life of the antenna. 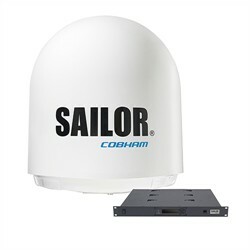 The most common Ku-Band VSAT choices for large yachts and ships are the 1 meter Intellian v100 and the Cobham Sailor 900 antennas; both fine choices. 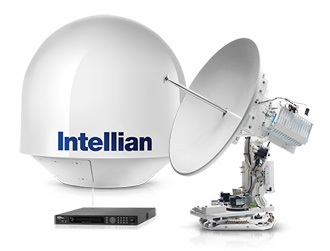 Both brands have the RF assemblies, including the BUC and LNBs, mounted at the center of the dish right behind the feed, which is most efficient for RF performance, minimizing the need for waveguide and coax feeds at high frequencies between the output of the Block Up Converter (BUC) and the feed. Locating much of the weight at the center of the gimbals has the added advantage of reducing the amount of heavy counterbalance weights required on older systems where the RF was distributed out on the side arms of the antenna. The centralized location of all the RF equipment into one module, allows easily convertion from Ku-Band to Ka-Band should one ever decide to switch to the Inmarsat Fleet Xpress, or other Ka-Band services in the future. Is 80 centimeters now the new 1 meter? Several antenna manufacturers claim that, due to technology improvements, their new, sub meter, 80 cm or 85 cm antennas perform as well as the legacy 1 meter antennas. I have heard of one independant test by a service provider that verified at least one of these claims, reporting that the antenna under test was actually better than a standard 1 meter antenna.. True or not, the differences would only be evident at the very edge of the satellite coverage footprints, or in a rain fade shootout between two antennas side by side in a thunderstorm. Either way, it is now common for major satellite service providers to accept some 80 cm antenna models on their networks, as if they were 1 meter antennas. 80 cm antennas do not require spread spectrum technology like the smaller 60 cm antennas, but make sure that your provider supports your particular model, before you buy the antenna. This means, that if you do not plan to go the GX (Ka) route, you might be better off with an 85 cm antenna that is less expensive, lighter and easier to install. 80738 visits to this page since 28 Nov 2012.